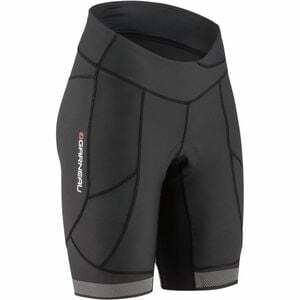 Product Condition: The CB Neo Power RTR Short - Women's is in Good condition. These shorts have only been worn once, there is a tear in the stitching and some fraying, but overall they are still in good condition. Kitting up for endurance rides takes a bit more forethought than you average after-work mosey through the neighborhood, that's why Louis Garneau crafts the Women's CB Neo Power RTR Shorts with compressive materials and a top tier chamois for the rides that go the extra mile â€” or thirty. With Neo Power fabric, you'll find a snug hug around your muscles to boost circulation and stability. This reduces fatiguing by steadying out micro-oscillations and stabilizing efforts your body undertakes on the bike. More stabilizing from the shorts means less energy you need to expend, so you have more power to put into the pedals as the miles add up. The Neo Power fabric also sees a special treatment of CB â€” short for Cold Black, that actively reflects UV rays while you ride, so wearing a black short doesn't have to mean baking under hot summer sun. A Motion AirGel Chamois designed specifically for Women tops off â€” er, bottoms off â€” the shorts, giving you comfortable support that's ideal for endurance rides. The chamois features gel inserts that take away the sting of long rides, absorbing chatter and road vibrations, while allowing sweat to escape through perforations. Multi-thickness high-density foam combines with the gel, boosting moisture evacuation, and adding more comfort that tapers to your anatomy. Vents at the front help to maintain breathability, letting fresh air in while you ride, and an odor-fighting fabric tops it off to keep you feeling clean as you hammer up the last big climb.